What did you say? あなたは何と言いましたか. What do you expect me to say to you? 私に何を言ってもらいたいのですか. I have nothing more to say (to you). これ以上何も(君に)言うことはない. Who shall I say, sir? どなた様でございましょうか 《★取り次ぎの言葉》. Easier said than done. 《諺》 口で言うほどやさしくはない 《言うは易く行なうは難し》. Say it with flowers. ⇒flower 1a. What did he say about the accident [on the subject]? その事故[件]について彼は何と言ってましたか. Something needs to [should] be said about it. そのことについて述べておかなければならないことがある. The less said about it the better. そのことは言わぬが花. He said to me, “Thank you, sir." 彼は私に「ありがとう」と言った. He said, “Yes, I will." 彼は「はい, やります」と言った 《★【用法】 次のように語順が変わることがある: “Yes, I will," he said. または “Yes, I will," said he. ; また “ " の中が短い時には, He said “Yes" to me. の形も用いられる》. 〔+(that)〕〈…と〉言う 《★【用法】 say to…that の形はあまり一般的でなく tell…that を用いる》. She said that she lived alone with her mother. 彼女は母親と二人だけで暮らしていると言った 《★【変換】 She said, “I live alone with my mother." と書き換え可能》. It's not too much to say that… …と言っても過言ではない. I must say you're exaggerating. 失礼ながらあなたは誇張している. They say [It is said] that we're going to have a warmer winter this year. この冬は暖かいということだ. I should [would] say (that)… (断言をはばかって)…と言ってもよいでしょう, …でしょうね. Don't say you don't remember me! まさかぼくを覚えていないなんて言わないでしょうね. “Will she come? "—“I should [would] say so [not]." 「彼女は来るでしょうか」「もちろん来ますよ[来るわけないでしょう]」 《★【用法】 この so, not は前文の内容を受けたもので, that 節の代用》. You may well say so. そうおっしゃるのももっともです. I cannot say when she'll come back. 彼女がいつ帰るのかわからない. I cannot say which way to go. どちらの道を行ってよいのかわからない. He said how glorious the sunset was. 彼は日没が何とすばらしいことかと言った. [be said to do で] 〈…だと〉言われている 《★【用法】 この文型での能動態はない》. He's said to be dead. 彼は亡くなったと言われている 《★【変換】 It's said that he is dead. と書き換え可能》. He's said to have done it. 彼はそれをしたと言われている 《★【変換】 It's said that he did [has done] it. と書き換え可能》. The Bible says, “Thou shalt not steal." 聖書に「盗むなかれ」と書いてある. The notice says, “No school on Tuesday." 掲示に「火曜日休校」と出ている. The sign says “Danger." その標識には「危険」と書いてある. The letter says that her mother is seriously ill. その手紙には彼女の母親が重病だと書いてある. My watch says ten past ten. 私の時計は 10 時 10 分をさしている. Your face says how much you want it. 君がそれをどんなに欲しがっているか顔に書いてある. Her eyes said that she was happy. 彼女の目に幸せだという気持ちが表われていた. Say your prayers [grace]. お祈り[食前(または食後)の感謝の祈り]を唱えなさい. [命令法または let's say で] 〔+(that)〕(仮に)〈…だと〉すれば. Say it were true, what then? 仮に本当だとすればどうだというのか. He said to tell you not to come. 君に来ないようにとの彼の言いつけです. It says on the prescription to take two pills after every meal. 処方箋に毎食後 2 錠ずつ服用するように書いてある. just as you say 君の言うとおり. I couldn't say. なんとも言えない, わからない. That, I should [would] say, is true. それはたぶん事実だろう. She is, I'd say, in her fifties. あの女性はまず 50 代といったところだ. Look at the map of a large city, say London or New York. 大都会, たとえばロンドンとかニューヨークの地図を見なさい. You will have to pay some money on account, say [let's say] five dollars. 内金を少し, そうだねえ, まあ 5 ドルぐらい入れなければならないだろう. I can't [couldn't] say. さあわからないな. I'd rather not say. 私には何とも言えないが, あまり言いたくない(が). 〔+in+(代)名詞〕[It を that 節の形式主語として] 〔…には〕〈…と〉書かれている. It says in our contract that we get three weeks' summer vacation. 契約書には 3 週間の夏期休暇があると書かれている. [間投詞的に; 注意を引くために用いて] 《米口語》 ねえ，もし，おい (cf. I SAY 【成句】 (1)). Say, that's a good idea. いやまったく, それはいい考えだ. Às you sáy! Hòw sáy yóu? I wòuldn't sày nó. Néver sày díe! You can sày thát agàin! You dòn't sáy (sò)! 不可算名詞 [また a say] 発言権，発言の番[機会] 〔in〕. We have a [no, some, not much] say in the matter. 我々にはその事に口を出す権利がある[ない, 多少ある, あまりない]. [have [say] one's say で] 言うべきこと，言い分. Let me have my say. 私に(も)言いたいことを言わせてください. Has everyone had his [her, their] say? みんな言いたいことを言ってしまいましたか. Who has the say in this matter? この事の決定権はだれにあるのか. Could you say your name again? I may say something I shouldn't, but here goes. “Did she like the present? "“She said so." If no one has anything to say, we will stop for today. The boy said,“Mom, I'm home." She said she couldn't sleep. He didn't say why he was so late. Are you saying that I should take a vacation? At school, they say we can't dye our hair, but most of us do. Everyone says that he is a great cook. She's said to be able to speak ten languages. He's said to have lost all his money gambling. They say he hit the jackpot in South America. The TV Guide said that the game would be on at 8:00. What does that sign say over there? Her face said nothing about what she really thought of me. The way he uses money says a lot about his values. The doctor said to watch what I eat. The recipe says to bake the cookies for 30 minutes. Before we start eating, let's say grace . Let's just say it rains, then what will we do? How about if we meet on, say, Friday at 11:00? I think it will cost, say, 20 dollars a person. I did as you had said, but I failed! Say, isn't that our old teacher over there? His reply was short, as if to say he didn't want to talk about it. I can't believe you lost your cell phone, but that is not saying much. Enough said, Mom, I won't go out tonight. I have something to say about the grading. I don't think the plan is great, but having said that, I can't think of anything better. I can't say I would want your job. I'd rather not say where we went. I'll say! That was a wonderful concert. I must say that is a lovely dress. I say! I can't believe the prices here. I say we go get some lunch. I should say that was not a very polite way to speak. “May I play with the puppy? "“I should say not." It is not too much to say that the new governor has brought a new approach to politics. It is not for your teacher to say what school you go to. I wouldn't say no to a beer right now. His behavior is wrong, not to say immoral. The way he handled those tough questions says a lot for him. His record says it all. Always say to yourself,“I can do it." You may say what you like, but I think she has a heart of gold. That is not to say we should give him money all the time. There isn't much to be said for his teaching methods. His clothes looked silly, to say nothing of his hair. 成句What do [would] you say (to [that] ...)? Let's get some sushi; what do you say? What do you say to a nice hot bath? When all is said and done, the speech went over pretty well. Who can say what will happen to her? Who says you can be married and happy? Who's to say that their way of doing things is wrong? 成句You can say that (again). “Wow, that was scary! "“You can say that again!" The general public feels like they have no say in government. All I want is to have my say and then I will leave. Say, isn't that our old teacher over there ? A: Did she like the present? B: She said so. Just because he says so doesn't mean it's true. If no one has anything to say we will stop for today. The less said , the better. Carl said to Linda, "I'll be back by seven. "≒ "I'll be back by seven," said Carl to Linda. She said (that) she couldn't sleep. He said he doesn't believe in God. Did he say why he was so late? Who did you say was to blame? I don't believe what they say; time isn't always money. They[People] say (that) he hit the jackpot in South America. The Bible says that thou shall not kill. Does that guidebook say where to get off? The doctor said (for me) to watch what I eat. Before we start eating, let's say grace [our prayers]. His reply was short and quick, as if to say he didn't want to talk about it. "Enough said, Mom, I won't go out tonight." I dare say he's the preeminent author of this century. I'd rather not say where we went- we just went out. If I may say so, Betty is a fantastic teacher, isn't she? A: Do you think you two will marry? B: I should say not! I can't believe you lost your cell phone, but that is not saying much; I lost my wallet and my phone. She comes and goes and never says boo to anyone. It would be wrong, not to say immoral, to take him from his father. These new figures don't say much for his economic policies. He said a mouthful when he talked about the need for school reform. The young worker said a mouthful when he complained about safety conditions in the factory. I will say this for those kids; they certainly have a lot of energy. Another failing grade? What have you got to say for yourself? Her record says quite a lot about her commitment to the environment. Do we want him or not? His record says it all. A: I need to buy texts, and my club fees are due, and.... B: Say no more. I'll send you some money. Everyone was talking, so I never had a chance to say my piece. You can say your piece, but make it short. If you want some help, just say the word. Always say to yourself, "I CAN do it." Say what? = What did you say? We should all get a "good" education at school, or so they say. Her mother, so to say, smothered her rather than mothered her. Strange to say, after our bitter quarrel, she acted as if nothing had happened. I like his idea, that is to say, we buy the food after we get there. There isn't much to [that can] be said for his teaching methods. There's no saying what he might buy this time. I thought the rooms could have been cleaner, to say the least. What did you say? You lost my ring!? What do [would] you say (to...[(that) ...])? A: Let's go shopping. B: Whatever you say, I don't care where we go. When all is said and done, the speech went over [down] pretty well. You can say that (again). A: Wow, that was scary! B: You can say that again! A: I think she is lying again about the money. B:No. you don't say! A: How about a rest? B:You said it! I'm dead. 1-1) When a specimen is very thin and consists of light atoms, it is said to be a weak-amplitude, weak-phase object. 1-2) It is often said that materials science is the study of the structure, properties, and synthesis of materials. 2-1) It can be said that inelastic scattering is less localized than elastic scattering. From Middle English seyen, seien, seggen, from 古期英語 seċġan (“to say, speak”), from Proto-Germanic *sagjaną (“to say”), from Proto-Indo-European *sokʷ-h₁-yé-, a suffixed o-grade form of *sekʷ- (“to tell, talk”). Cognate with West Frisian sizze (“to say”), Dutch zeggen (“to say”), German sagen (“to say”), Danish sige (“to say”), Norwegian Bokmål si (“to say”), Norwegian Nynorsk seia (“to say”), Swedish säga (“to say”). The adverb and interjection are from the verb. Please say your name slowly and clearly. Martha, will you say the Pledge of Allegiance? To tell, either verbally or in writing. He said he would be here tomorrow. I want to say I’m sorry for yesterday. - It’s okay, Anna. The sign says it’s 50 kilometres to Paris. They say "when in Rome, do as the Romans do", which means "behave as those around you do." They say that Hope is happiness; But genuine Love must prize the past. It is said, a bargain cannot be set aside upon inadequacy only. It’s said that fifteen wagon loads of ready-made clothes for the Virginia troops came to, and stay in, town to-night. 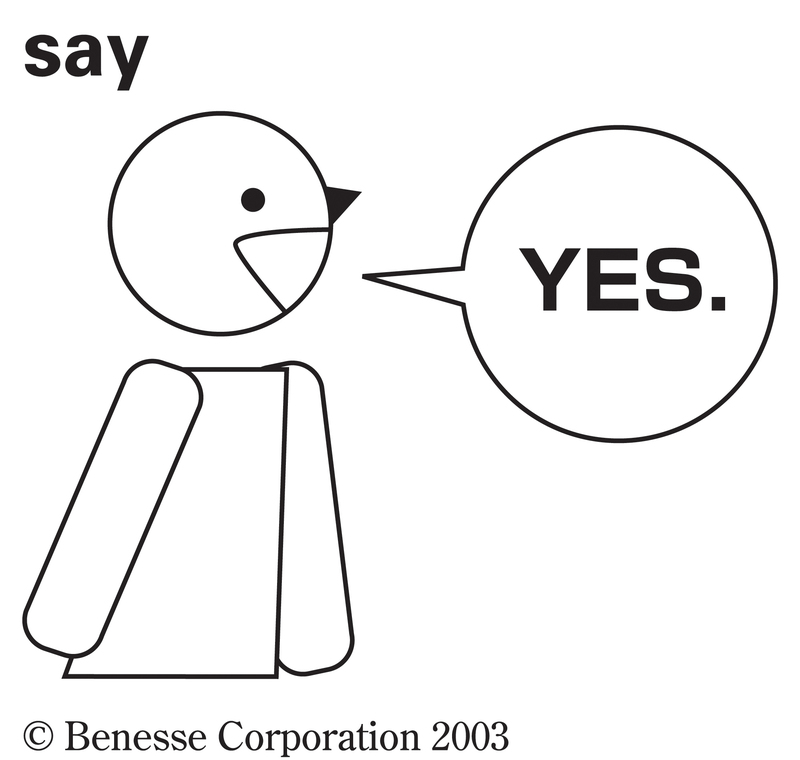 (informal, imperative) Suppose, assume; used to mark an example, supposition or hypothesis. A holiday somewhere warm – Florida, say – would be nice. Say he refuses. What do we do then? (intransitive) To speak; to express an opinion; to make answer; to reply. (transitive, informal, of a possession, especially money) To bet as a wager on an outcome; by extension, used to express belief in an outcome by the speaker. A chance to speak; the right or power to influence or make a decision. Above all, however, we would like to think that there is more to be decided, after the engines and after the humans have had their says. He has consolidated the military's role in politics through an army-drafted 2017 constitution widely seen as designed to prevent Pheu Thai from returning to power and ensuring a continuing say for the army. say in The Century Dictionary, New York, N.Y.: The Century Co., 1911.
say in Webster’s Revised Unabridged Dictionary, G. & C. Merriam, 1913. From Middle French saie, from Latin saga, plural of sagum (“military cloak”). Per[igot] VVell decked in a frocke of gray, / Wil[ly] hey ho, gray is greet, / Per. And in a kirtle of green ſay, / [Wil.] the greene is for maydens meet. If those principal works of God […] be but certain tastes and says, as if were, of that final benefit. (Scotland) A strainer for milk.